S&S® Performance Replacement cylinder heads for 1986-'99 HD® Evolution® big twin engines are designed to be compatible with a stock style flat topped piston. 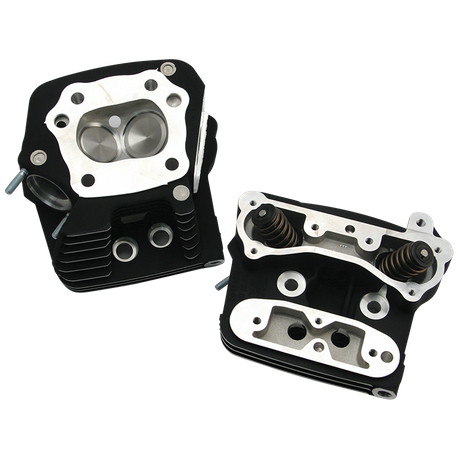 This set has a slightly larger 82cc combustion chamber making them idea for larger displacement applications, producing a managable compression ratio. These heads are original equipment on S&S® V96 and V80 engines. Larger than stock 1.900" intake and 1.575" exhaust valves provide plenty of air while maintaining port velocity for good low and midrange response. S&S® high lift valve springs allow the installation of cams with up to .585" lift. Compatible with stock intake manifolds, exhaust systems, and temperature sensors for EFI equipped models. Wrinkle black powder coat finish.